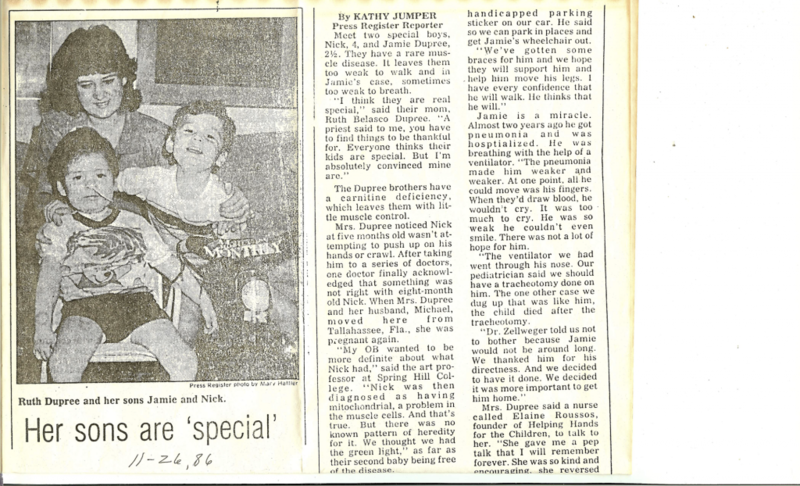 This 1986 Press-Register article about me, Jamie and Mom, especially Jamie, surviving the rare disease, was digitized by my Aunt Nancy in Virginia. Thank you. Mom gave me permission to post this here. It’s so old the newspaper was still called the PRESS-REGISTER! Back then the medical knowledge and approach to mitochondrial myopathies was much broader/more vague to say the least, and our carnitine deficiencies resist supplementation. We are certainly even rarier than 28 in the world. Today’s definition of mitochondrial myopathy largely excludes us, and metabolic medicine has de-listed carnitine deficiency as a distinct disease. It is now considered a symptom. It’s my hope the article could help confirm my story about our unusual diagnosis, exceptionally uncommon for the time to put it mildly. 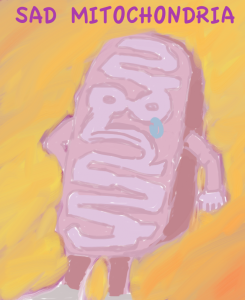 And that the article could also somehow help other weird metabolic children…. Thanks to Alejandra far copying it down. Photo caption: Ruth Dupree and her sons Jamie and Nick. Meet two special boys, Nick, 4, and Jamie Dupree, 2 1/2. They have a rare muscle disease. It leaves them too weak to walk and in Jamie’s case, sometimes too weak to breathe. The Dupree brothers have a carnitine deficiency, which leaves them with little muscle control. Mrs. Dupree noticed Nick at five months old wasn’t attempting to push up on his hands or crawl. After taking him to a series of doctors, one doctor finally acknowledged that something was not right with eight-month old Nick. When Mrs. Dupree and her husband, Michael, moved here from Tallahassee, Fla., she was pregnant again. “My OB wanted to be more definite about what Nick had,” said the art professor at Spring Hill College. “Nick was then diagnosed as having mitochondrial , a problem in the muscle cells. And that’s true. But there was no known pattern of heredity for it. We thought we had the green light,” as far as their second baby being free of the disease. But a visiting professor from the University of Iowa, Dr. Hans Zellweger, told them the hard facts. He diagnosed Nick as having a carnitine deficiency and said there was a one in four chance that two-week old Jamie would also have it. A month or so later, it was clear Jamie had the disease. And Zellweger told them that there were only 28 documented cases worldwide of carnitine deficiency. Nick has gotten better. He can’t walk but he runs nonstop around the house on his scooter. He has a light, compact wheelchair that he uses at the school he attends for gifted children. He goes to gym and dancing classes. “Nick doesn’t in any way regard himself as handicapped,” she said. “Nick says Jamie’s handicapped. I asked him why we had a handicapped parking sticker on our car. He said so we can park in places and get Jamie’s wheelchair out. Jamie is a miracle. Almost two years ago he got pneumonia and was hospitalized. He was breathing with the help of the ventilator. “The pneumonia made him weaker and weaker. At one point, all he could move was his fingers. When they’d draw blood, he wouldn’t cry. It was too much to cry. He was so weak he couldn’t even smile. There was not a lot of hope for him. “The ventilator we had went through his nose. Our pediatrician said we should have a tracheotomy done on him. 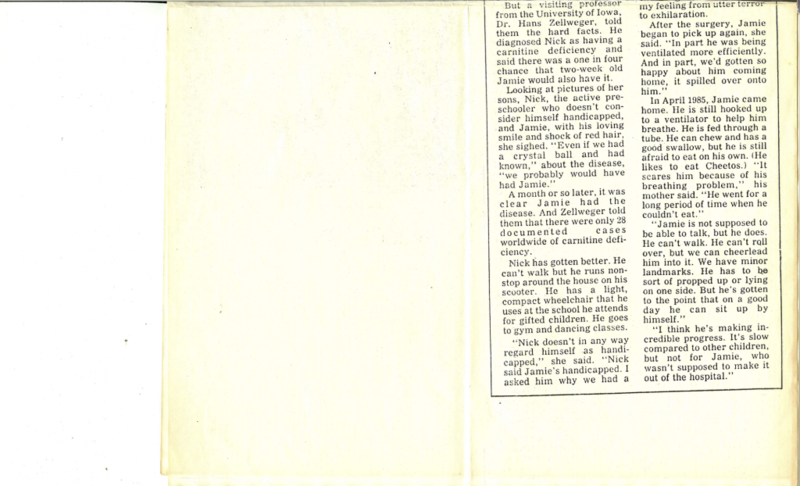 The other case we dug up that was like him, the child died after the tracheotomy. Mrs. Dupree said a nurse called Elaine Roussos, founder of Helping Hands for the Children, to talk to her. “She gave me a pep talk that I will remember forever. She was so kind and encouraging, she reversed my feeling from utter terror to exhilaration. I’m a bit late on this one… the holiday season’s crowding in on us, and soon people will consider it winter instead of fall, but I want to cover this anyway since few know there are autumn seasonal fruits. The source for this, primarily, is the Greatist.com list 19 Seasonal Fruits and Veggies to Eat This Fall. The mythical apple, poisoner of Snow White, a symbol of temptations that made it into Renaissance paintings of Eden (though the oral tradition often points out Eve and Adam ate grapes, fruit of the vine that still carries power). Apples are good to eat, and a product of autumn harvest, which is why you see Fall Festivals with candy apples or “bobbing for apples” contests. But not all apples are created equal. There are over 7,500 varieties of apples: of these, “Fuji apples have the highest concentration of antioxidants, phenolics, and flavonoids, while Cortland and Empire apples have the lowest” (the Greatist article). I like Granny Smith apples too…. though I’m guessing they’re somewhere in the middle on flavonoids, I’ve found them to have a mild stomach-calming effect. I have mitochondrial-related disease of some sort, and when I was at my worst in Fall of 1991, there was a time when I couldn’t keep anything down excepting Granny Smith apples and peach sparkling water. High-flavonoid, high-antioxidant foods become super important when dealing with mitochondrial involvement in disease, or eating for mitochondrial health just because you find it helpful. I write with the former in mind. The kiwi is an unusual fruit. They’re berries, with tiny edible seeds like a strawberry, but they grow on a vine, but they have an inedible furry exterior like a less ambitious coconut. Australasia tends to have bizarre animal species, like the kangaroo and duckbill platypus, and the kiwifruit is like the duckbill platypus of the berry family (though it didn’t begin in Australasia). Originally yang tao or the “Chinese gooseberry,” it spread from Southern China to New Zealand in the early 20th century and became popular with American GIs stationed in New Zealand during World War II. “Jack Turner of produce exporters Turners and Growers suggested the name kiwifruit in 1959.” (from Wikipedia), Kiwifruit orchards subsequently spread and got bigger in New Zealand, and by the ’80s their cultivation was thoroughly globalized and they became available in your local produce aisle. Kiwifruit like growing in Mediterranean climates like New Zealand, California and Italy and Chile. Italy actually has a slight lead over New Zealand in tons of kiwis produced annually and is world #1 in kiwifruit tonnage (source). But I think most Italian kiwifruit likely supplies Europe, and U.S. buyers probably have kiwi from California or Chile, though surprisingly this 2005 world kiwifruit production map shows upstate NY as having North America’s only productive kiwifruit orchards (at least for 2005). Bees have to pollinate kiwis for good yields, but they prefer pollinating other, less difficult plants, so it’s a beekeeper challenge. More on our threatened bee population in another post. Warning: kiwifruit may cause allergic reactions in sensitive people. Personally, I do like them, they just get a bit harshly acidic… so eating a big one at once can burn. The kiwifruit I’ve eaten in NY are enormous compared to what I remember from the late ’80s. Size and acidity varies widely by kiwifruit species (there are around 60 species). 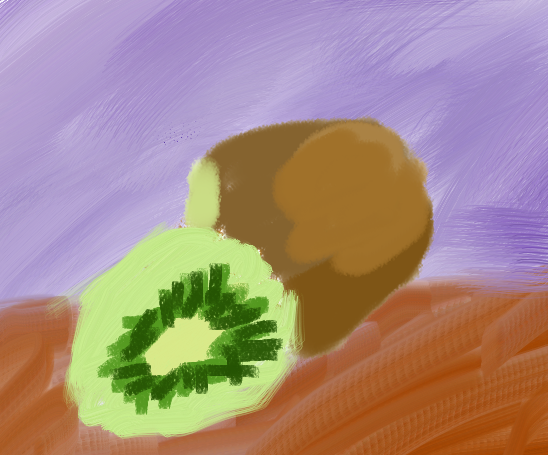 I painted a kiwi, hopefully well enough it’ll help you identify one should you encounter one in your daily life. Of course, if you live in a food desert like the scenarios I described in my previous post, it can be difficult to impossible to access healthy seasonal fruits…. This year from June to present (mid-August) I’ve been deep in the diagnostic jungle, repeatedly going back to Columbia Presbyterian hospital in hopes of answers, a diagnosis, a treatment, anything… and I’ve written a series of long Facebook posts/epic mito updates, trying to make sense of life, the universe and everything as we close in on diagnosing me with something more specific than “unknown metabolic disease” or “we think something’s wrong with your mitochondria,” over 31-years into this journey. Note: not all metabolic diseases are mitochondrial diseases, but all mitochondrial diseases are, by definition, metabolic diseases. For example, adrenoleukodystrophy (ALD) featured in the movie Lorenzo’s Oil, is definitely a metabolic disease, unmetabolized fatty acids end up harming myelin and wreaking havoc on the brain, but not mito-related. Tay-Sachs disease is metabolic disease because it’s a lipid-storage disease that wrecks the brain, depositing unmetabolized junk in the brain like ALD except differently, with different processes, and with consequences much much worse, but it’s not mito-related either. Right now the only thing we can say with absolute certainty about “Nick and Jamie disease” is that it’s an inborn error of metabolism, either a new mitochondrial disease or a wholly new metabolic disorder unrelated exactly to mito. 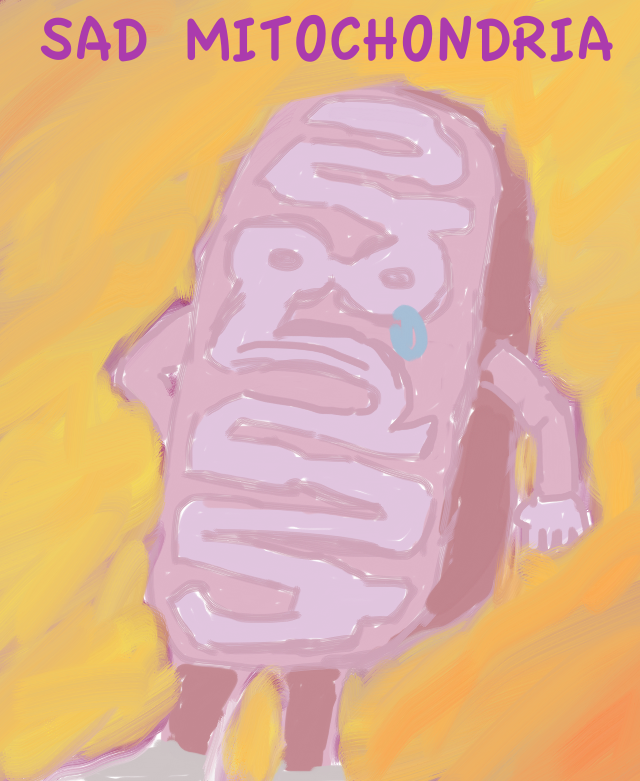 Though I strongly suspect mitochondrial involvement, irrevocable proof requires more waiting. A Nick cell line of sorts is being created from a skin biopsy taken July 29th for further mitochondrial testing, and I hope these tests can provide answers in the coming weeks and months. I’ve been remiss in updating ya’ll on the visit with the metabolic disorders team… Well, the team is great, they only see patients with rare metabolic disease, so they’re actually designed to have time to deal with someone like me, something amazing in and of itself. This is what I’ve been looking to circle back to at Presbyterian since visiting the hospital in 1999, flying up from New Orleans to NY (thank goodness I could fly direct—avoiding the 7th Hell that is Atlanta Hartsfield Airport—and the Continental Airlines team at Louis Armstrong New Orleans International was good to me). … the start of the more appropriate formula happened Thursday, and I hope that will end the problem of my body consuming its muscles for want of protein. Though they too must operate within the often-maddening and time-leeching constraints of prescriptions, increasingly-frustrating Medicare/Medicaid bureaucracy, etc., I feel they’re awesome, the best medical thing that has happened to me in New York… they feel like the sea of fail parting miraculously and the angels singing and so on…even if they don’t know something, they know that they don’t know which is hugely advantageous in-and-of-itself, as many of the complications I’ve encountered over the years have arisen from doctors and hospitals wrongly assuming that I have a more typical muscular dystrophy. It’s been a long, tough road… On the adult side of hospitals the assumption seems baked-in that, if you’re already on a ventilator and tube feeding (OMG “life support!”) their treatment plans have already failed, there’s slim to none that their type of medicine can offer you and they’ll tell you, “there’s nothing I can do.” Most were uncomfortable with me as they thought me outside their purview, someone to be referred to hospice or the like. Since I’ve escaped from Roosevelt Island in September ’09, most doctors I’ve encountered have written me off as end stage, or even booted me downstairs to the ER (happened twice at NYU, though I have no beef with the excellent ER people) instead of keeping my appointment, so uncomfortable were they with me, ventboy on a stretcher, before even laying eyes on me… Given the harsh reality of this, I don’t blame anyone turning to homeopathic, alternative medicine, dietary approaches, etc. But on the pediatric side of the hospital, there seems to be a natural, intuitive understanding that yes, some childhood diseases are so severe that a vent and G-tube are needed, so it’s not beyond the pale in their world, not a foreign concept. Them living in the pediatric world makes a huge difference, this kind of metabolic team wouldn’t exist outside of that, at least in this hospital. Then there’s the fact that this team exists, is there, that the nurse practitioner actually will talk to you, you’re suddenly not completely isolated while working to survive. And the expertise with mitochondrial diseases, that is great…for years I’ve been eager to not be the only one in the room sharing mito knowledge, way ahead of everyone in info despite the fact that most of my information stems from 1980s understandings of mitochondrial disease, outdated and long-ago surpassed by the advent of genetic testing. I desperately want to learn, to communicate about the disease… and even before genetic tests are back, I’ve learned so much about this unknown metabolic disease I have, like how deeply nutritionally-based it is (to the extent I don’t think it even “progresses” without a nutritional crisis or shock to the system triggering it to consume muscle for nutrients/ATP). We’ll know more soon, and I’ll share it with ya’ll once I know. Mitochondrial myopathy is still under the “muscular dystrophy” umbrella, MDA ambassador Mattie Stepanek had it in similar form, I have never seen phenotypes as similar to my family as the Stepanek family… the difference Stepanek/me seem to have from DMD and SMA is the metabolic/nutritional roots of the disease, happening on a deeper cellular level with much more complicated processes. Finally, I didn’t mean to scare people with my last long FB post, because I’m not sick, I was just talking about the chronic disease, and specifically our attempts to fix a nutritional problem we believed to be exacerbating the underlying metabolic disease. Probably it shocked people because I seldom write about the underlying condition, and the handful of status updates on health in the last four years have come only when something is really wrong, like I’m on IV antibiotics or something else related to pneumonia. The thinking around disability in the U.S. is heavily tilted toward the discrimination and architectural barriers as the disabling factors, which they are, and I support that approach too, as such fixable disabling factors have been overlooked far too long. But the unfixable disabling factors, the mitochondrial myopathies and other forms of muscular dystrophy, the multiple sclerosis, the ALS, the spinal cord injuries and TBIs and so forth that cause the disability community to be made up of disabled individuals, are no less difficult because we look away from them in favor of focusing on the fixable. In America with our “rugged individualism,” we’re all supposed to be super-crip, rappeling off any obstacle with a wire in our teeth, crossing the Sahara Desert with your hands, wheelchair on your back… the camel sitting in the wheelchair on your back instead of you sitting on the camel…I know, I know, I get it. But sometimes it’s okay to be honest, and definitely human, to share the harder parts of living with whatever disease is part of us. In my previous long status update, I was talking about the problem that Dr. H identified, that my body was apparently harvesting my muscle for protein, and the visit to fix that… hopefully now, it’s fixed. Sometimes the apparently unfixable can be helped, if not cured. Hat tip to Raul for this; he’s a guy on a vent who has the TK2 mutation, and he found it out from being in an NIH study to identify cases of TK2 and other rare mutations that were previously unseen or misdiagnosed and they want to involve him in possible Columbia clinical trials of TK2 treatments. …since August 2012 they have been trying different treatments on the TK2 mice. According to the below article, they’ve discovered a treatment that stops/slows disease in the mice… not yet does it reverse the disease but the current trial is to improve it enough to make the disease rewind a bit, not just the slow button. Diagnosing mito was in its earliest phase at this point, and looked nothing like the mito diagnostics of today. University of South Alabama Medical Center, which ONLY included the antiquated old hospital in Toulminville and some offices around the main school off University Blvd at the time, was able to verify loss of the carnitine supplements given me coming out on urinalysis, not just carnitine deficiency but total non-absorption. This was deemed so unusual, so extreme, only mito weirdness could explain it. But now, in the 21st century mito world, a diagnosis as un-specific as “mitochondrial myopathy” is a relic of an era long before genetic tests existed. Until the exact dysfunction is found, the diagnosis isn’t valid, it could be one of a bajillion possibilities. Which mitochondrial myopathy is it? though I consider myself diagnosed in infancy, and consider even the generic diagnosis valuable for what to avoid (infections, potentially mito toxic drugs etc) I understand the need to grok the disease process and its causes in order to devise treatments. I want treatments, something to make my day-to-day experience even SLIGHTLY better, and I know we can’t get there with the current diagnosis. As researchers unravel the mysteries of the metabolic processes that animate all life, the ordered complexity seems to approach infinity, like the laws of physics with their sub-atomic and sub-sub-atomic and sub-sub-sub-atomic particles, the order of which Einstein compared to seeing God. While metabolism shares the complexity of physics it doesn’t have its godly elegance. Metabolism is messy; it’s more the Hebrew Bible version… sometimes you almost shect your son but don’t, sometimes your wife gets turned to salt, sometimes you’re Job! But metabolic processes are mind-bogglingly complex, and mitochondria are at the center…. …hundreds of different proteins coded in your regular DNA that your mitochondria need, with different transfer mechanisms to get into the mitochondria, so without even getting into potential errors internal to the mitochondria or the mitochondrial DNA, there’s infinite potential for external problems… essentially healthy mitochondria can be starved of a crucial protein. In TK2 mutation, the pivotal TK2 protein is polarized wrong and can’t transverse the mitochondrial membrane… the TK2 protein has been flagged as a trespasser… TK2 Mongols can’t get past the Great Wall… defensive measures have been activated! This is why mitochondrial diseases are so devilishly difficult to diagnose! I, like many, won’t have my myopathy pinpointed excepting the miraculous new gene sequencing supercomputers. Two weeks ago, my gene sequencing came back negative for mutation of the TK2 gene … the quest for a more precise diagnosis continues. we have reason to believe that Jamie and I have regular DNA mutation that is causing the error of protein or protein transfer mechanism into the mitochondria… Separately, we have exome sequencing underway (the exome is the portion of the regular DNA that codes for proteins). The exome sequencing has me, Jamie, Mom & Nana in the data set… comparing multiple family members/multiple generations of us provides points of reference and ways to make sense of tens and tens of millions of base pairs… see what’s in common, what’s not. We’re closing in on the baddie, and while the skin biopsy taken Monday afternoon may or may not provide insight through more extensive mitochondrial testing, I’m optimistic that the exome sequencing will pinpoint the exact mutation… we expect the full sequencing results no later than November 1st and possibly weeks sooner. though the uncertainty that it’s really mito is all but gone since the tests results came back negative for every known form of muscular dystrophy earlier this month. I am different than many in that I don’t have neuro symptoms, mainly it is muscle loss so bad there’s nothing left to biopsy, and my body temp overheating constantly, though, judging from the mito bloggers out there, lacking neuro symptoms isn’t as uncommon as I thought. The United Mitochondrial Disease Foundation—UMDF, which didn’t exist until 1996—says there’s a lot of cases added each year, with “1,000 to 4,000 children in the United states born with a mitochondrial disease” annually. As one of my favorite mito mom bloggers put it, it feels like an epidemic. I’d agree, rates of mitochondrial disease are up, and I think environmental factors are to blame…the fact that we pump pollutants and radiation into the natural world without knowing the potential mito-toxic consequences, and then we eat, drink and breathe from the natural world, and the external becomes the internal as those food materials become the matter you’re made of, the building blocks of the human. But the causes of the mutations that trigger mitochondrial disease understandably take a back seat for people like me and families who’re in daily coping-and-survival mode. I’ve been following some of the mito blogs, and I am awed at how parents and loved ones of mito children (kids similar to me as a kid) are using the web to support each other. I wish this had been available for me and my mom when I was a kid (back in the 1980s and early ’90s). As a survivor of childhood mito, I’d really like to share what I know, help others avoid some of what I’ve suffered, be a knowledgable listener and advisor among the mito bloggers, though I know I don’t exactly fit in with the mom blogs. I really want to help, and when I see kids going through what I went through, the BiPap, the chronic pain—which is still a constant battle for me—I really want to talk to, help, that family. And I want to help build a network of mito-activists and mito-knowledge to help those of us dealing with these diseases, who are too often treated horribly by the medical-industrial-complex, like anyone with complex medical needs that are difficult for them to understand. We need a veritable army of people behind us just to survive the system. I’m not sure exactly how to get such a network off the ground. But paired with the experience and knowledge mito bloggers have collectively, such a community could be a game changer. Speaking of mito knowledge, there’s been controversy recently about the study published in Nature Medicine that proved a link between L-carnitine and arteriosclerosis, gunk in your arteries that causes heart attacks and stroke. Since the study focused on giving L-carnitine to mice with normal microbiota, normal gut processes and digestion, those of us taking daily L-carnitine supplements to treat a mitochondrial disease wonder how this effects us, if at all. With its emphasis on red meat (the most carnitine-rich part of the American diet), the study has been covered heavily all over the mainstream news channels—THIS from CBS News is a representative sample—with a lot of pics of red meat and beef B-roll producers love. When I think of this study, I don’t think of beef, I think of research residents giving mice micro-baby bottles of liquid L-carnitine in their cute mouse mouths, but that’s just me. Because of this high-profile news and the—not necessarily invalid—concerns about arteriosclerosis, I’m being pushed to discontinue my L-carnitine supplements. The UMDF recently issued a statement urging caution. Because of the specifics of my mito journey, I’m reluctant to drop the carnitine. I first started taking carnitine through Dr. Zellwegger’s clinical trial for the FDA’s safety and effectiveness human trials 1984-1985, via University of South Alabama, before carnitine was on the market. Literally I’m getting carnitine in my baby bottle. Then we couldn’t get carnitine when the trials ended. Then in September 1991, when I was 9, I had what I call a “mito collapse” immediately following back surgery and an intense infection at the surgical site. The thin muscle I had was gone in less than a week, the opposite of “slow progression.” I went into a tailspin, ileus, dismotility and malabsorption so extreme that I was put on TPN. All your classic mito symptoms, at least that’s how Mom and I perceived it at the time. It makes sense that, in an inborn error of metabolism, the digestive system—where the heavy lifting of metabolism occurs—would be greatly effected, and BOY was it during this time. My digestive system grinding to a halt, the futile cramping, it was the most horrific thing I had experienced up to that point. For a few months, all I could keep down by mouth was the peach-flavored version of this very specific carbonated water, something like this. Fortunately, carnitine was on the market, and some time very close to the day I began using the BiPap, I was started on the L-carnitine. Post-levocarnitine, the digestion problems ceased, and I haven’t had any ileus or needed TPN since that time. The supplements seemed to stop the free fall. So I’m scared to go off carnitine… but never say never. I would be willing if it’s part of an audit of my entire “mito cocktail”—which since 1996 or thereabouts has been Levocarnitine, B2 and CoQ10—in totality, with other things changed, added, a systematic approach. Each of our journeys with mitochondrial diseases are different, certainly none are easy, and many days it feels impossible. I really hope we can communicate more, network more, putting our knowledge together and gaining strength in numbers. Please comment below or on Facebook or Twitter.